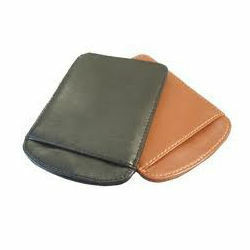 We offer a wide range leather product of pouches. Leather credit card pouches which are ideal to carry important papers and documents and credit cards. Available in black and brown colors, these are widely appreciated by our clients for their classy design and fine finish. Moreover, following are the features of our range of leather credit card pouches. Looking for Leather Credit Card Pouches ?